Here we are in the winding lanes of west Norfolk, out beyond the Swaffham to Fakenham road. Out here, secret villages hide in folds of fields and woods, and lanes peter out into nothingness. Of course, it isn't all a secret. 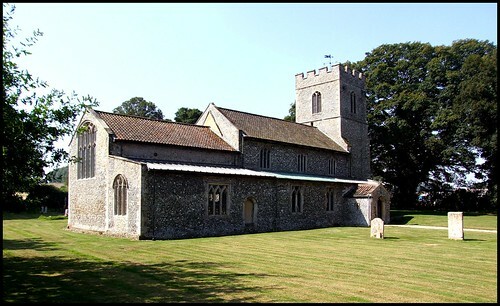 Castle Acre, for example, is one of the best known and loved villages in Norfolk. Its castle, priory and church attract plenty of tourists, as do its pubs and tat shops, but I wonder how many visitors make it to this delightful little corner, about a mile's walk from the high street? 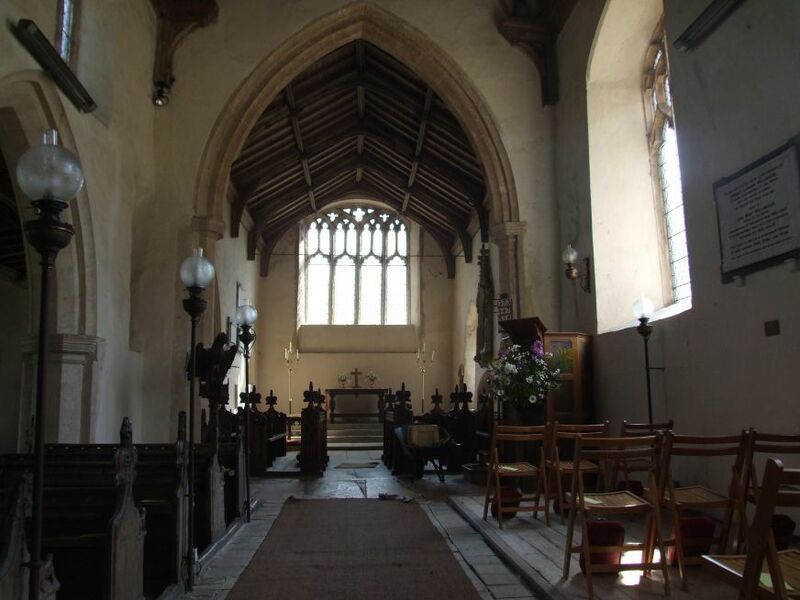 South Acre is little more than a church and a few houses, and the church is humble and homely in comparison with the splendour and delights of the nearby larger village. 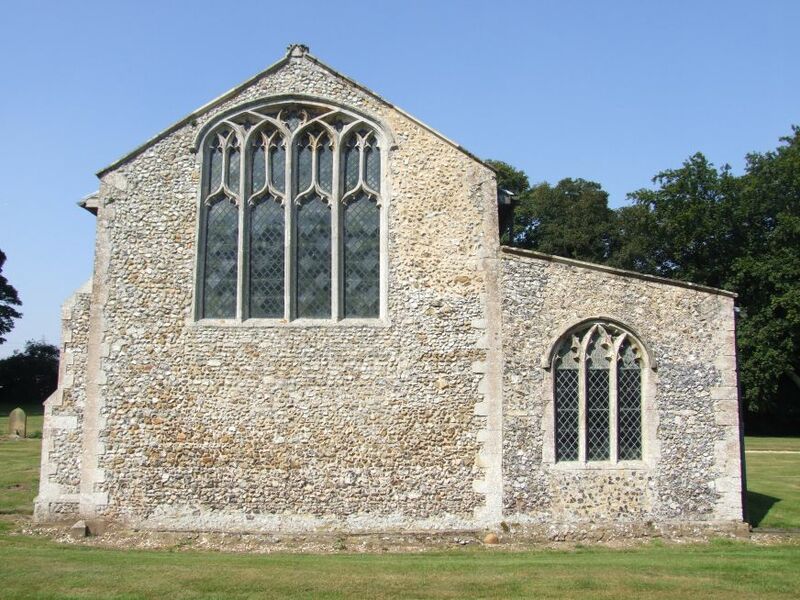 But inside this building is one of the most atmospheric and fascinating interiors in Norfolk, full of historical details and a sense of the numinous. 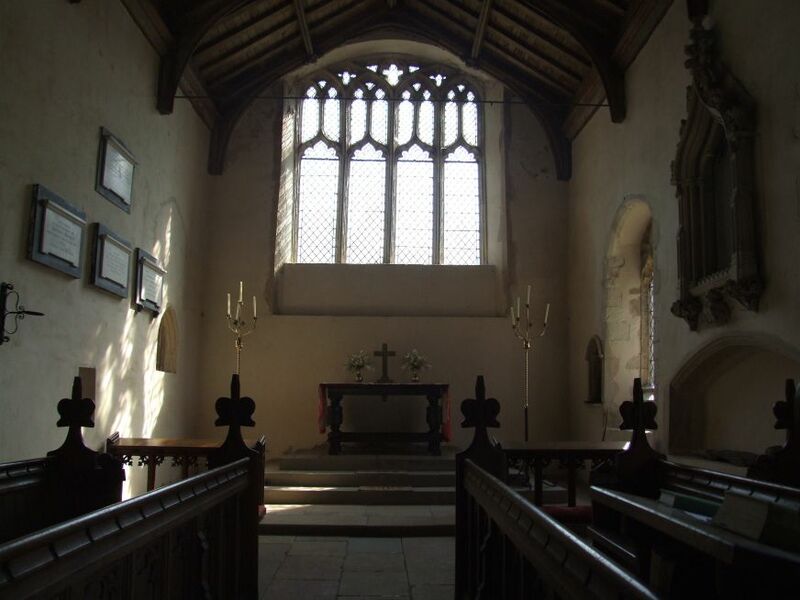 It is one of my favourite small churches in England. Externally, the building is rather curious, its south and north sides being completely different in character. 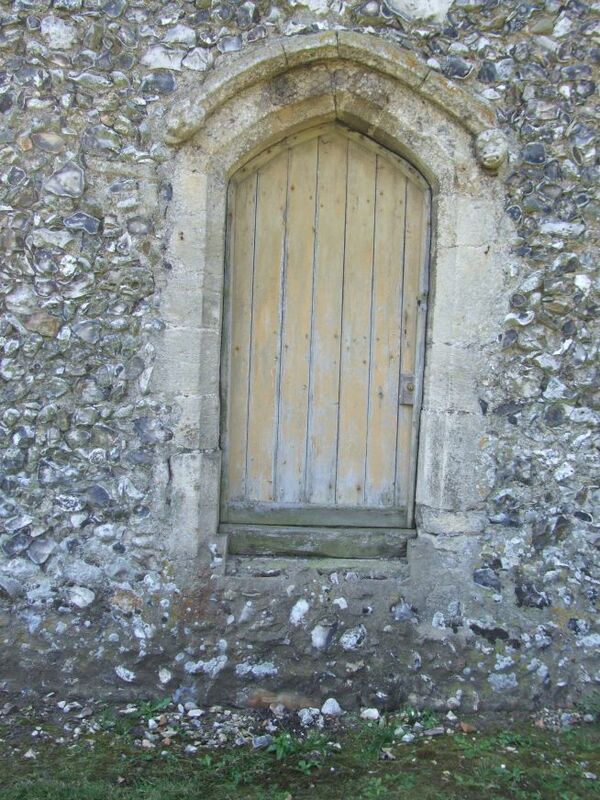 The north face, which it turns to the road, is organic and earthy, full of 14th century grandeur. The south side is crisper and of the character of the 15th century, although I suspect this is mainly the result of 19th century restoration. 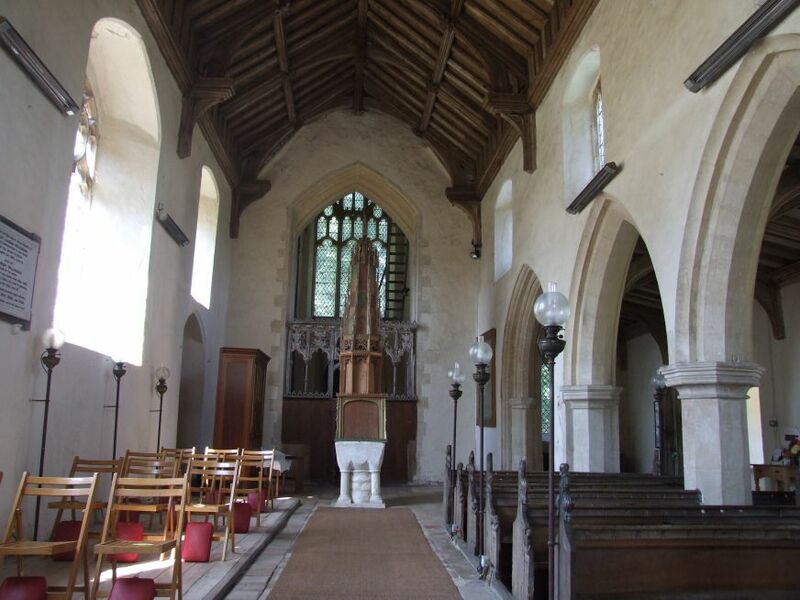 The entrance is from the north, and you step into a perfectly rural and ancient space, with brick floors spreading in all directions, and the rugged, primitive Norman font topped by a 16th century Perpendicular canopy which lifts the eyes to the beautiful hammerbeam roofs. To the east runs a homely, low arcade, dividing off the north aisle. This aisle contains the most significant feature of the church, the Barkham mausoleum of the early 17th century, behind a contemporary wrought iron screen. 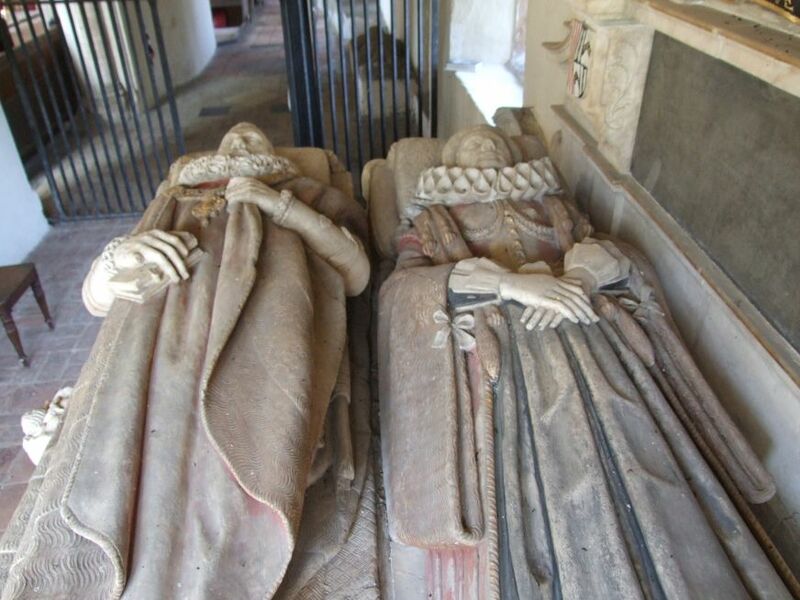 Sir Edward Barkham, who died in 1623, was a former Lord Mayor of London, and the memorial he shares with his wife Penelope is one of the most delightful in Norfolk. It was made by the Christmas Brothers, and features Sir Edward and Lady Penelope lying together, their heads facing west. They are dressed elegantly in the clothes of the day, but it is really the details of the tomb which catch the eye: Life as a young girl, and death as a grinning, shrouded skeleton, flank the inscription, while an hour glass sprouts gilt wings. Below, two sons and three daughters kneel in prayer, but they seem distracted, lost in thought and peering around corners. Between them, a charnel cage is filled with the skulls and bones of the Barkham dead. The whole piece is utterly enchanting. The Barkhams rather steal the show here, but it is another family, the Harsicks, whose name is found the most often. 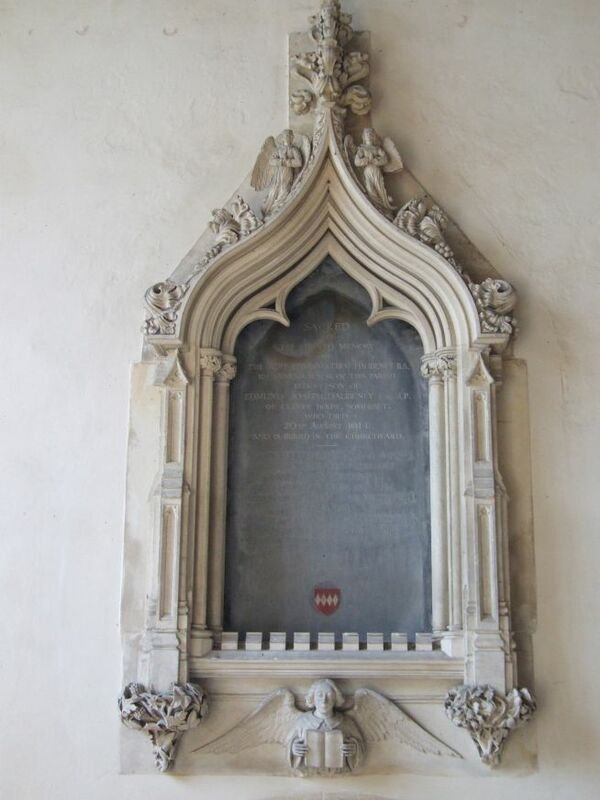 At the west end of the Barkham memorial, within their chapel, is a large brass to Sir John Harsick and his wife. Harsick died in 1384, and the formal portrait of the pair, almost life-size, is softened when you notice with a frisson, in Larkin's words, his left-hand gauntlet, still clasped empty in the other; and one sees, with a sharp tender shock, his hand withdrawn, holding her hand. Then the image becomes a perfect illustration for An Arundel Tomb, proving our almost-instinct almost-true, what will survive of us is love. Another Harsick is probably the stone effigy of a Knight Templar further west, Sir Eudo, who is known to have taken part in the crusades. More intriguing, and certainly more startling, is the eroded wooden effigy, now in a tomb recess on the south side of the chancel. 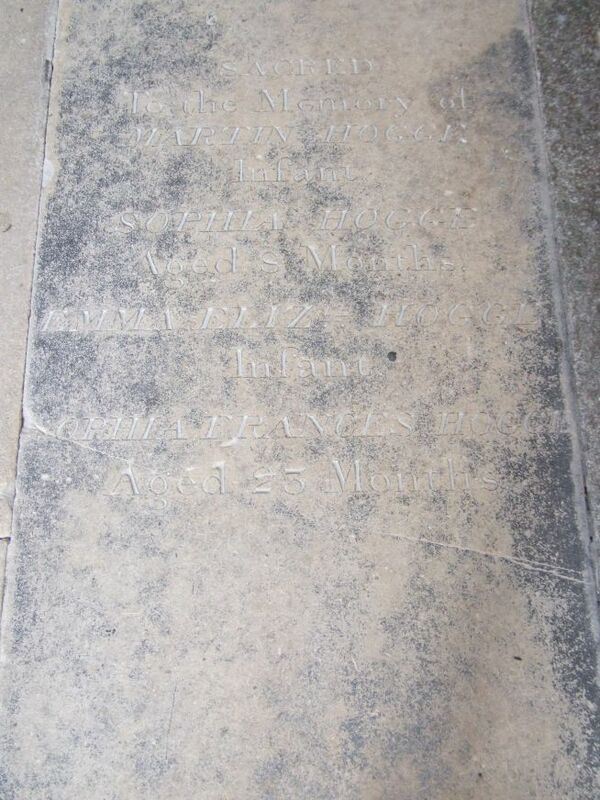 On the floor nearby is another brass figure, Thomas Leman, who was Rector here and died in 1534 - assuming this inscription was made pretty soon after his death, it had barely a decade to ask for prayers for his soul before such things became illegal. 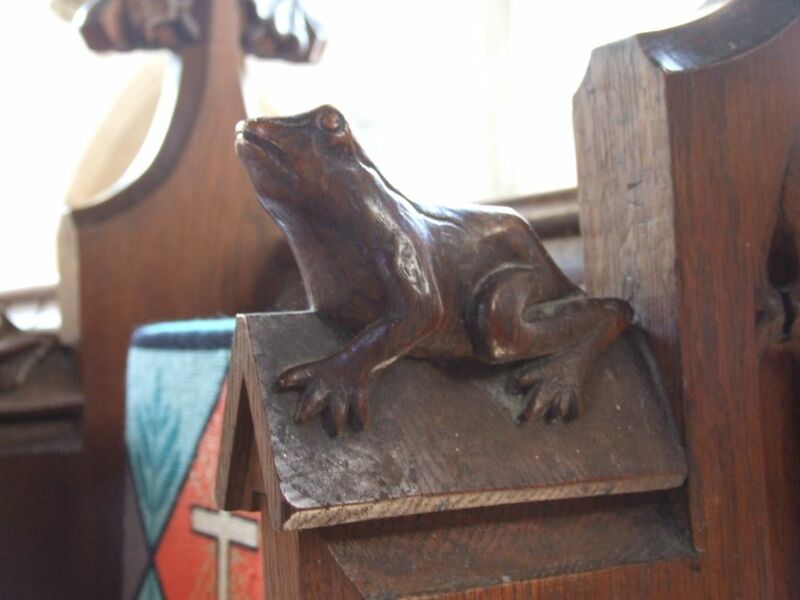 Another brass figure is in the nave, of a similar date. There is a simple engraved brass of the Blessed Virgin and child, a rare survival; I only recall seeing this twice elsewhere in East Anglia. 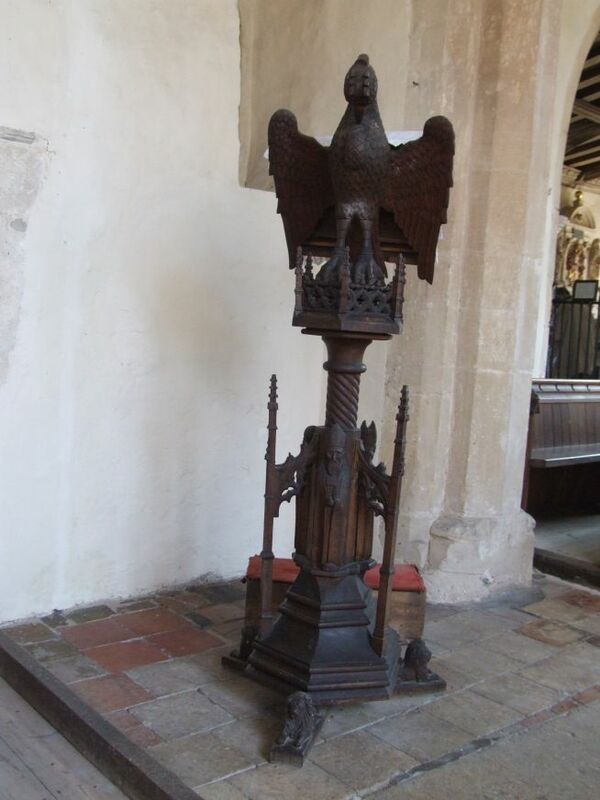 These, taken with the inscription on the font cover which asks for prayers for the soul of Geoffrey Baker in 1534 suggests that, in the last gasp of Catholic England before the Reformation, a large amount of money was spent here at South Acre. There is a smattering of medieval glass in the north aisle, and bench ends which are probably a century earlier than the font cover. But even if it was not for these, the utter charm of this pretty interior would be enough of an enticement. And little details that speak of the care of centuries past; the stone memorial in the chancel wall tells us that, in August 1725, the Reverend Mr William Brocklebank new pavid this chancel with stone at his own charge, had the gravestones clean'd and laid even, removid none that had any inscription, but gave three plain ones to be laid in the body of the church. 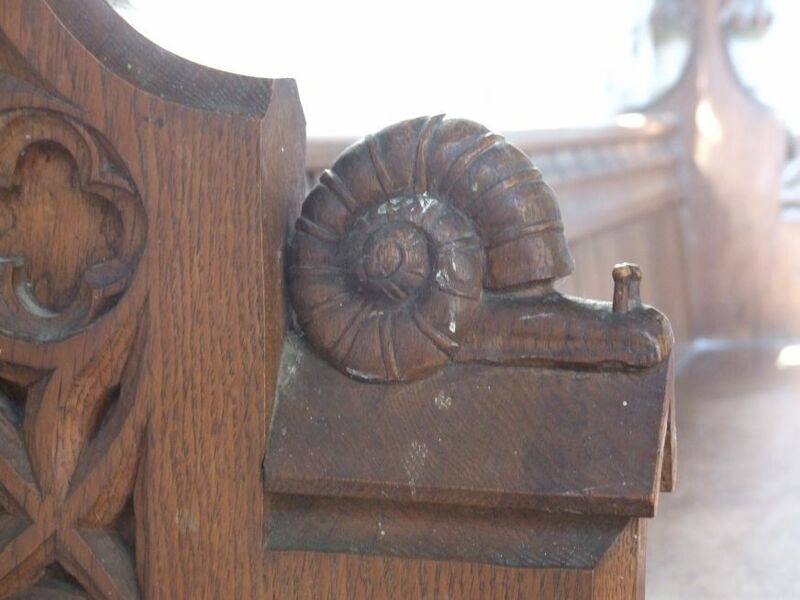 There are ledger stones in the north aisle to an 18th century Rector, George King, and his relict Elizabeth, and pretty bench ends carved by an early 20th century successor, including a snail, a frog and a fish. It all builds to a harmonious whole, the perfection of a gorgeous, rustic little village church, the slowly beating heart of its parish.